Obtained from our rich experience and vast knowledge as a Supplier, Exporter and Importer, we have been able to offer the best quality of Digital Torque Wrench Tester (DOTE3-G). It has many features such as it is fully digital. 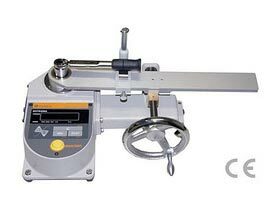 Its measurements are designed by setting the torque wrench horizontally, wrench weight correction is not necessary. It is easy to operate with the "Auto Zero" function. It can be correctly applied to the effective length of the torque wrench with the loading device errors caused by improper application of force is considerably reduced. Loading device applies load to the effective length point, which allows for more stable testing conditions. Universal AC Adapter (AC100-240 V +/-10%) can be used in most countries worldwide. New Version DOTE3-G features multiple units of measure through keypad setup. Model Torque Range Inlet Drive Torque Wrench Max. Effective Length Dimensions [mm] Weight Approx.